Note, I missed spelled the authors name. If you arrived here looking for the book note how her name is spelled on the cover, not how I spelled it. Jo Anderton. 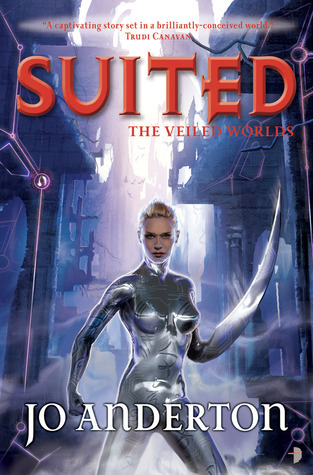 Suited is the second book in The Veiled Worlds trilogy. I received an ARC of Suited from the Robot Army at Angry Robot. The single sentence about Suited at Goodreads is a very good description of the book. All of the characters from Debris, the first book, are back as well as the introduction of some new ones. I think I am beginning to get an idea of what the Veiled Worlds are. Pions and debris are still a mystery but they are the heart of the story. Pions build and create debris. Tanyana used to build with pions but now collects debris. Tanyana learns a lot more about her suit and all of that information is critical to the story. This is an interesting series and I look forward to book three. Angry Robot published Suited by Jo Anderton in 2012. There are a few other book that I have read and not review. The Duke's Perfect Wife by Jennifer Ashley - This on has been on my TBR shelf for quite a while. It is the last book in the series. It was not as good as my favorite in the series (The Madness of Lord Ian MacKenzie) but it was a good end to the series. Questionably Human by Miss Kitty Roads - This is a SFR and was free on Amazon. A lot of it was very predictable but fun to read. Beneath the Starry Sky by Jessica E. Subject - Another free book from the author and Amazon. This was a novella in the "One Night Stand" series. Like the previous book it was predictable but fun to read. My book beginning this week is from The Shape of Desire (Shifting Circle #1) by Sharon Shinn. I love her books and when I was at the library yesterday I checked it out. I haven't started it yet but it is next on my reading list. And here is the first line: "It's around two in the morning when I hear a rustle and bump in the kitchen, and I sit up in bed." The description of Woman at the Light caught my attention. While true to that description I found the book itself to be lacking. Characters: The main character, Emily Lowry, is certainly strong in some areas but weak in charting her own course. She just went with the flow. Her actions were not consistent with what I expected. Character development was not that strong in the book. Plot: The story line moved at a good pace. Again I felt that much of the development was weak. This was a pleasant book to read. It just did not have the tension I expected. Worldbuilding: The historical setting is interesting. The history of Key West is accurate. I did feel that it was not totally true to the feelings and actions of people of that era. Everything sounded sugar coated. I have very lukewarm feelings about the book. This is the first book by Joanna Brady that I have read so I don’t know if this is typical of her writing or story telling but based on this book I probably will not pick up anything else she has written. 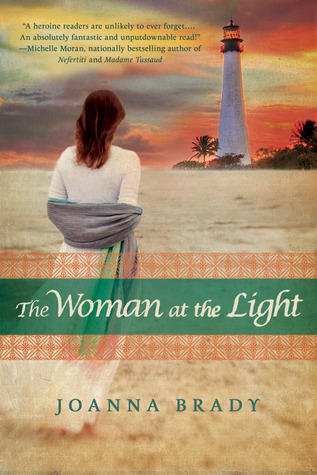 St. Martin’s Press published Woman at the Light by Joanna Brady in 2011. 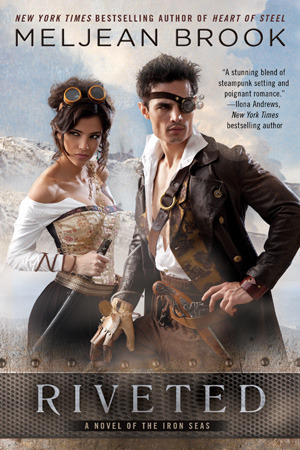 I am waiting on Riveted (Iron Seas #3) by Meljean Brook due out September 4, 2012. I love this series and have read both of the books and all of the novellas. Here is what Goodreads says about book 3. 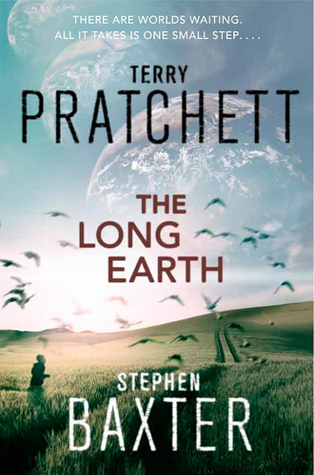 My Teaser is from The Long Earth by Terry Pratchett and Stephen Baxter. The quote for from 60% on my Kindle. "What is the Long Earth for?" "I suppose that's what we came out here to find out." I do try to set goals. Mostly they are to read and review the books I have chosen from different sites and books that I have accepted from authors for review as well as books I have purchased. Right now my goal is to read one book I have purchased followed by one book I have accepted to review. 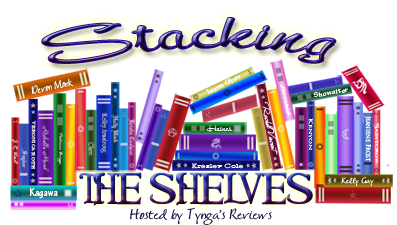 That way each TBR stack is not ignored. Anna M is the winner of the $5.00 Amazon Gift Card. Anna please get in touch with me to collect your prize. 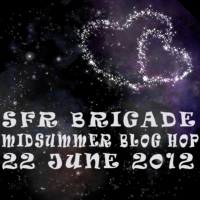 Thanks to everyone who participated in the Midsummer Blog Hop. Hope we can do it again next year. Loretta Chase is one of my favorite romance writers so when I saw Scandal Wears Satin on Edelweiss I requested a review copy. Of course I had to start reading immediately and had trouble putting it down. This is the second book about the children of Catherine DeLucey (one of those Dreadful DeLucey’s) and Edward Noirot (a seducer and swindler of the first order). As I found out in the first book, Silk is For Seduction; their daughters are not following in the family footsteps. Instead they are attempting to make their living honestly as dressmakers to the ton. A blue-eyed innocent on the outside and a shark on the inside, dressmaker Sophy Noirot could sell sand to Bedouins. Selling Maison Noirot's beautiful designs to aristocratic ladies is a little harder, especially since a recent family scandal has made an enemy of one of society's fashion leaders. Turning scandal to the shop's advantage requires every iota of Sophy's manipulative skills, leaving her little patience for big, reckless rakes like the Earl of Longmore. The gorgeous lummox can't keep more than one idea in his head at a time, and his idea is taking off all of Sophy's clothes. Characters: Building wonderful characters is one of Loretta Chases' strength. Sophy and Longmore are wonderful. Sophy is smart, versatile, and loyal. Longmore is smarter than he looks and smart enough to go after Sophy. Laugh Factor: Like previous books there is a great deal of humor in the book. Even when things look bleak the dialog between Longmore and Sophy adds a light touch to the story. Plot: There are a lot of twist and turns to the book. Sophy is trying to keep the shop going and her mind is always working. At times I didn't know what she was up to so there were plenty of surprises throughout the story. Longmore even managed a few of his own. Tension: That was there through out the book. Just as it looked liked things were going to calm down a new situation raised the tension to a higher level. Writing: The story was skillfully woven. I did not see a scene that could have been cut. Everything that needed to be in the story was there with nothing extra to distract from the story. Clothing: In this series the clothes are another character. The descriptions of the various dresses made me glad I live today. Just seeing what was required to get into and out of the various outfits left me exhausted. I think that Scandal Wears Silk will go on my favorites self right beside Lord Perfect and Mr. Impossible both by Loretta Chase. Avon published Scandal Wears Silk by Loretta Chase in 2012. That is the first sentence from The Breach by Patrick Lee. I found The Breach at the library. It had a Science Fiction sticker on it and looked like it was a mystery to boot so I checked it out. Haven't started it yet but it is the next book on my stack. I received an ARC of Shadow of Night by Deborah Harkness. From Netgalley and was reading it when I signed up for this hop. Deborah used Midsummer Night it as a way to get Matthew and Diana out of the house for the night in 1590 England (where you usually were not safe to be out after dark). I won’t tell you why she wanted them out all night. That would be a spoiler but I can share a harmless quote that tells some of the history of the time. “No, Matthew said, “the bone fires. Traditionally people celebrate Midsummer Eve by lighting fires: bone fire, wood fires and mixed fires.” This was after Diana asked why all the bones were stacked up outside houses. Another author who uses Midsummer is S.M. Stirling. He uses not only Midsummer in his Dies the Fire, he also uses the entire Wiccan Religion as part of the story line. Kier Salmon has a post about how she helped with the research for Dies the Fire. It is titled A Popular SciFi Novel Featuring a Witch and is worth following the link to read. In Tales of the Cthulhu Mythos by H.P. Lovecraft there is “curious sights to be seen about the monolith on Midsummer Night…” Like in other stories Midsummer Night has special powers. C. S. Lewis used it as a reference in a scene that “roared as a woodland bonfire on Midsummer night” in The Chronicles of Narnia. In Hawk Eternal (Hawk Queen Novels) by David Gemmell it is used as a way to show a length of time. “It lasts two weeks from Midsummer’s Night…"
Leave a comment with your favorite book that uses Midsummer in the plot so you are entered into the drawing for prizes? What prizes? ONE PRIZE FROM COMMENTS ON MY BLOG! All comments will be entered into the drawing for the Grand Prize. Visit as many of the blogs below as possible and leave a comment (only one comment per blog) to get more entries. Be sure to leave your email address so you can be notified if you win a prize. The prolog for A Gentleman Undone is in June of 1815 and the story starts nine months later. Book one in the Blackshear Family series is A Lady Awakened. It did not follow the usual path of historical romances. I loved A Lady Awakened and wanted to see if A Gentleman Undone had the same unusual story line. Another difference was that unlike a lot of the historical romances the main characters are not members of the ton. They are the class just below. Look at what Goodreads says about A Gentleman Undone. Characters: Both Lydia Slaughter and Will Blackshear have what they think are unforgivable secrets in their past. Those secrets mold their actions and in the end are what bind them together. I loved both of the characters. They are strong willed and tortured. Will is Martha Mickwood’s youngest brother so the Mickwoods are among the characters that appear from the previous book. There are some new secondary characters who play a important part. Only one really caught my attention and I wondered if he would be the main character in the next book. Plot: The plot revolves around the secrets both Lydia and Will carry and their drive to make things right. Tension: There is a lot of sexual tension between Will and Lydia. That leads to tension between Will and his family. It also leads to tension with other secondary characters in the book. Writing: Cecilia Grant uses the tension to tell a very good story. Like A Lady Awakened her characters and story are unlike other romance books set in the time period. She is carving a unique place for her writing. I will be watching for the next book in the series. Unfortunately A Woman Entangled is not due out until the Spring of 2013. Bantam Books published A Gentleman Undone by Cecilia Grant in 2012. I am waiting on Heart Secret by Robin Owens. It is scheduled for release on August 7, 2012. I always look forward to a new addition to the series. 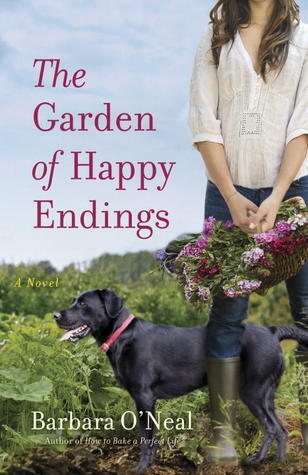 My Teaser today is from The Garden of Happy Endings by Barbara O'Neal. "I do need to think about what to do with my life now that she's finished with college. I love being a mom but I guess I'm kind of redundant now, aren't I?" Be sure to come back on June 22 to see my post and leave a comment for a chance to win. 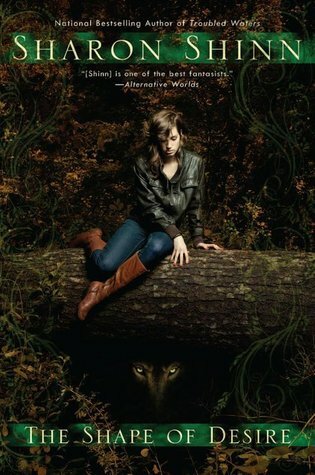 Born to Darkness by Suzanne Brockmann - I have read several reviews on this book. People either love it or hate it. I put it on reserve two week ago and it just got in so now I will see how I feel about it. Grantville Gazette VI Edited and Created by Eric Flint - I am reading the 1632 books and the Gazette contains stories that go alone with the books. Fatal Remedies by Donna Leon - This is my next audio book. I don't know anything about it except it is a mystery. I purchased the entire month of April 2008. I am reading the 1632 series and was going to purchase The Cannon Law. When I checked out the other book in the month I had not read any of them so I just purchased all 6. The Garden of Happy Endings by Barbara O'Neal - This is a Last Harvest book. I had passed it up before even though it looked interesting. When it got down to 2 copies left I requested and got one of them. Thea Harrison has a good publishing mix going with her Elder Race books. Berkley publishes her Elder Race novels and Samhain Publishing releases her Elder Race novellas as eBooks. There is always a gap between novels but the novellas help fill the gap. Here is what Amazon says about Devil's Gate. When it comes to love between a medusa and a Vampyre, it’s every man, woman, and snake for themselves. As a coroner, medusa Seremela Telemar has always felt more comfortable chatting over a dead body than over drinks. But when her wild niece, Vetta, runs off to Devil’s Gate, a lawless town that has sprung up overnight in a modern-day gold rush, she knows she has to extricate her before the rebellious girl gets into real trouble. Though she’s confident in her head snakes’ ability to defend her against attackers, Seremela is still a bit nervous about braving this modern-day Wild West by herself. Vampyre Duncan Turner is not about to let his new co-worker go into that chaos alone. His Vampyric power and lawyer smarts make him the perfect ally, and the fact that he already had his eye on Seremela for more…personal reasons, doesn’t hurt matters. Any romantic thoughts pull up short, however, when they arrive at Devil’s Gate and learn Vetta is set to hang by morning. In order to save Vetta and themselves, Seremela and Duncan are going to have to fight fire with force and magic with fangs. And pray they make it out of Devil’s Gate alive. Characters: There are mentions of characters from the Elder Races novels but the main characters here are unique to this story. I would never have picked a women who had snakes instead of hair as the main character but it does work. The snakes are almost an independent character. They have their own personality and in their way are charming. .Seremela is used to people being uncomfortable around her and loves the fact that Duncan likes her as she is. While there is not a lot of time for character development I did get a very good picture of both main characters. Side characters were important and there was enough information to make them real. The Tarot cards are an inanimate character and make another appearance. They seemed to point to the next character to be featured in a novella. Tension: There is some but there is so little time in a novella and the tension comes near the end of the story. 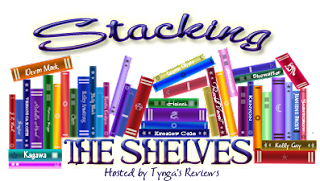 Writing: Thea Harrison manages to get a good mix of new characters along with tie-in from the novels in there novellas. Devil’s Gate is no exception. Samhain Publishing, Ltd. 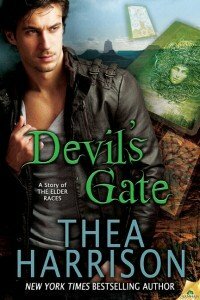 Published Devil’s Gate by Thea Harrison in 2012. I received Tangle of Need and put it aside because I hated the cover (guess covers do have an effect on my choice of reading). I still hate the cover but as soon as I started reading I was lost in the Psy/Changling’s world. Here is Goodreads summary. Despite what the summary says Tangle of Need contains more of Hawk and Sienna’s story than that of Adria and Riaz. Thrown into to that are the scenes that feature the Psy. Characters: While Adria and Riaz are very good characters I really never was caught up in their story. By the time Riaz met his mate she was in love with someone else. Adria was recovering from a very bad relationship. They should not have fit but they did. I just did not care. Fortunately their story was almost a side story and the other characters held my attention much better. There was a lot more of Sienna and Hawk along with others from around the Psy/Changling world. Worldbuilding: Nalini continues to add new dimensions to the Psy/Changling world. This time there are new clans and new human allies introduced. There is also more information about the Psy world and the people who live in Silence. Plot: Getting Riaz and Adria together is part of the plot but the main driving force for the story is the coming problems with Silence. There will be war again and much of the plot concerns what both sides are doing to get ready. Writing: Great as always. I fell right into the Psy/Changling world. Once I started reading I had a hard time stopping. Now I am waiting for the next book. I read somewhere that Nalini Singh is working on ending the series. I know that must happen some time but I hope there are a few more books left before I have to say good-by to the Psy/Changling world. 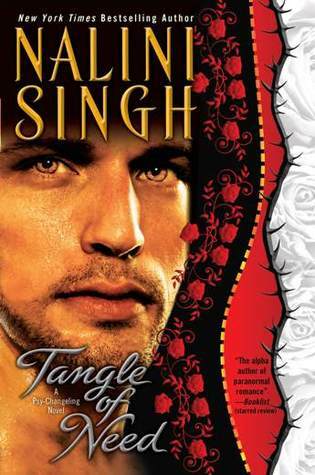 Berkley Sensation published A Tangle of Need by Nalini Singh in 2012.